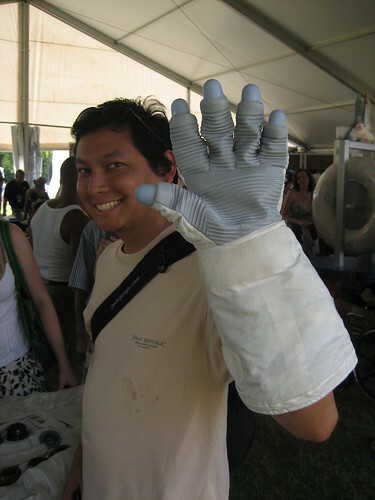 This comes a bit late, as Amy just uploaded it, but here’s a photo she took of me trying on an Apollo spacesuit glove, courtesy Ron Woods of NASA back during the 2008 Folklife Festival. It was a very hot glove, and had been sitting around a NASA storage facility for decades before being rolled out for hundreds of sweaty kids and adults to try on. But hey, this was as close as I’ve gotten to being an astronaut. So far. Update: For those of you asking what the stuff on my shirt is, it’s Bhutanese dumpling sauce.